27 March 2010. Technically, the winner of the 2010 Templeton Prize of $1.5 million was Francisco J. Ayala, a 76-year-old evolutionary geneticist and molecular biologist. The award was to honor Ayala for making "an exceptional contribution to affirming life's spiritual dimension." The award has nothing to do with science, yet the announcement of the award took place in the lecture hall of the US National Academy of Sciences in Washington, D.C. Without a doubt, the real winner was the Templeton Foundation itself. Not only did it gull the NAS into letting it rent its facilities for the announcement, the choice of Ayala guarantees continued media and blogosphere coverage until the actual check is handed over on May 5th by the Duke of Edinburgh in a private ceremony at Buckingham Palace. 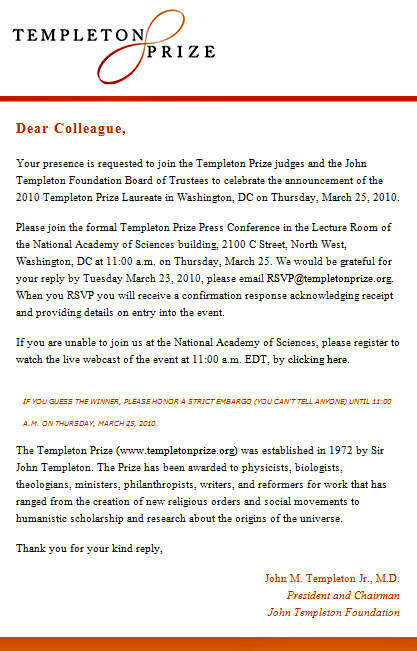 The US National Academy of Sciences has brought ignominy on itself by agreeing to host the announcement of the 2010 Templeton Prize. This is exactly the kind of thing Templeton is ceaselessly angling for – recognition among real scientists – and they use their money shamelessly to satisfy their doomed craving for scientific respectability. They tried it on with the Royal Society of London, and they seem to have found a compliant Quisling in the current President, Martin Rees, who, though not religious himself, is a fervent 'believer in belief'. Fortunately, enough Fellows made a stink about it to ensure that the Royal will not flirt with Templeton in future. Now Templeton are apparently trying the same trick with the US National Academy. If you know any officers, or elected members, of the Academy, please write in protest. Incidentally, look at the fatuous request in capital letters in the middle of the announcement: "If you guess the winner, please honor a strict embargo (you can't tell anyone) until 11.00 am on Thursday March 25th 2010." Embargo a guess? It is one thing to put an embargo on privileged information, but embargo a GUESS? Well, I suppose that is just another indication of the way a faith-head's mind works. Their whole world-view, after all, is founded on an inability to distinguish evidence from an ill-informed guess. Well, let's all guess away to our heart's content. Which leading scientist has done the most to betray science in favour of his imaginary friend? You can rule out the people they'd privately like to honor (such as Intelligent Design "theorists") because that would go against the official policy of courting respectability among scientists. Nowadays they target genuinely good scientists (like Freeman Dyson, winner of the 2000 Templeton Prize), whose subversion provides more bang for the (mega)buck than primarily religious figures who happen also to be scientists. In the early days they didn't even make a pretence of finding a scientist at all: the 1982 winner was the notorious creationist Billy Graham! The smart money for the embargoed God's Applepolisher Guess (GAG) is on Francis Collins (he's the person who finds C S Lewis persuasive, and who saw the Trinity in a three-pronged frozen waterfall), but I'd place a side bet on Simon Conway Morris or Martin Nowak. The highlighted areas indicate that the Big Fish took the bait and ran with it, much to the delight, I'm sure, of the Templeton folks. Equally delightful to them, no doubt, was Ayala's criticism of Dawkins's "scientific fundamentalism." PZ Myers was soon patting Dawkins on the back for his flamboyant rhetoric and accurate assessment of the situation. Myers guessed that the winner would be Francis Collins (if Dawkins's criteria were used), but he added: "I wouldn't be surprised if Ken Miller is solidly in the running, though, and if he doesn't get it now, he probably will in the next few years. I bet Michael Ruse lusts after that prize, but his drooling is just a little too obvious." Jerry Coyne commented: "This is an outrage, of course, and shame on the National Academy for its implicit endorsement of religion. If they say, “Well, we rent our space to anybody,” then I look forward to seeing an adult film festival at the NAS. I’m guessing that this year’s winner, based on the location, will be Francis Collins...Runners-up may be Kenneth Miller, Karen Armstrong, John Haught, and Robert Wright." The response of the scientists who are among our most vocal anti-theists was inevitable and exactly what the Templeton folks would have hoped for. They might have hoped for more offensive and hyperbolic language from Coyne and Myers just to fuel more interest in their Foundation, but every little bit helps when you're trying to dupe the world into thinking you're doing something important. The main goal was to get the NAS to appear to host an award ceremony for service to religion. The cries of outrage and betrayal by scientists were just icing on the cake. Their jabs at Ken Miller, Francis Collins et al. added another layer to the icing. There will be no quiet call for an investigation into who gave the keys to the NAS to a group whose main function is to promote religious ideas. Heads will undoubtedly roll, but it will not be done quietly. Again, this must be very pleasing to the Templeton folks, as it will call attention to their activities and continue to pay dividends well beyond the date when professor Ayala cashes his check from them. In the last decade...the Prize has been continually given to people inhabiting the Templeton Foundation’s inner circle, who promise to keep contemporary science inviolate and make sure that religion keeps its hands off. With Francisco Ayala’s receipt of the prize yesterday, the pattern continues. Ayala is as thorough-going a Darwinist as one will find. According to him, science and religion reside in air-tight compartments. So much for a fruitful dialogue between science and religion. In his acceptance today of the £1 million Templeton prize for "an exceptional contribution to affirming life's spiritual dimension", evolutionary biologist Francisco Ayala forcefully denied that science contradicts religion. "If they are properly understood," he said, "they cannot be in contradiction because science and religion concern different matters." I don't believe this, and Ayala, a professor at the University of California, Irvine, should know better. Science is about finding out how the physical world works. The only way in which science and religion can "concern different matters" is if religion has absolutely nothing to do with the physical world occupied by its believers. But - and here's the rub - that is exactly what Templeton "religion" is all about. Its efforts to find common ground between science and religion have systematically destroyed pretty much every religious claim. Little in the creed of the Presbyterian church, for example - of which the late John Templeton was a lifelong member - survives its axe. When I attended a journalism fellowship funded by the Templeton Foundation in 2005, I learned from Templeton-endorsed scientists and theologians that the way to establish a peaceful co-existence of science and religion was to make no religious claims at all. They said that creationism is out, as is intelligent design. There can be no afterlife. Nor does anyone have an eternal soul. There was no virgin birth - that was most probably a story made up after Mary was raped by a Roman soldier. There was no physical resurrection of Jesus. None of the miracles actually happened. And prayers are not answered. This is Templeton version of religion. A stripped-down, vague and woolly notion that there is something "other" out there. It makes no claims beyond that. Being so very vague and undefined puts the new Templeton religion comfortably beyond assault from questioners. But is it really religion? Not by any terms I am familiar with. I can't help thinking that Jack Templeton, the evangelical Christian head of the foundation, would agree. Religion is surely defined as a belief system involving a specific set of ideas about what the universe is all about. By its efforts to validate religious belief in scientific terms, Templeton has actually stripped religion of all ideas, rendering it entirely pointless. My advice? If you have a faith that is important to you, don't try to rationalise it. It's OK to be religious, believing that there's a purpose to the universe and that you have an insight into a hidden realm of knowledge. As neuroscientists and psychologists are discovering, that's actually the default human state. But attempting to prove your religion is based on anything rational or scientific is a fool's errand. As the Templeton Foundation has rather self-defeatingly shown over the last few years, it just doesn't work because they actually do have overlapping concerns, whatever Ayala says. The best I can say for Mr. Brooks is that he's quite confused. On the one hand, he seems to agree with what he thinks Ayala and the Templeton folks believe: that religion is a vague, fuzzy, warm feeling you get when thinking that there's some purpose or meaning to the universe. That feeling has no clear cognitive content, and it's pointless to try to bring in science to prove the universe has a purpose and that your precious consciousness will not dissolve into nothingness. On the other hand, he seems to think that theologies like intelligent design (or studies on prayer or miracles) really tell us something scientific about the nature of the supernatural. In any case, the negative press from the defenders of ID will call attention to the Templeton folks. Being praised for its decision by the National Center for Science Education, whom Ayala has supported from its beginnings, was expected. Getting attacked by bitter enemies such as the anti-theists and the IDers must be positively orgasmic for the Templetons.